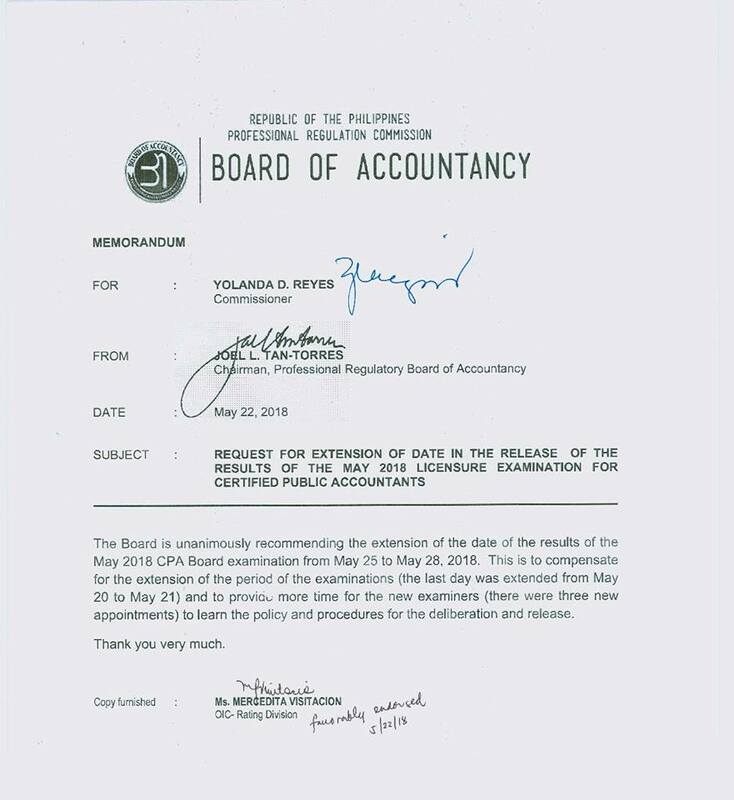 MANILA, Philippines – (Updated 5/28/2018) The Professional Regulation Commission (PRC) and the Board of Accountancy released results of May 2018 Certified Public Accountant CPA board exam on Monday, May 28 or in five (5) working days after the last day of exam. The complete list of passers, top 10 (topnotchers), top performing schools and performance of schools are available on this page as announced online. A total of 2,843 out of 9,830 (28.92%) successfully hurdled the exam, PRC said. NOTE: There's no such list of conditional examinees being released online as opposed to the claim of other unofficial website/s of PRC. 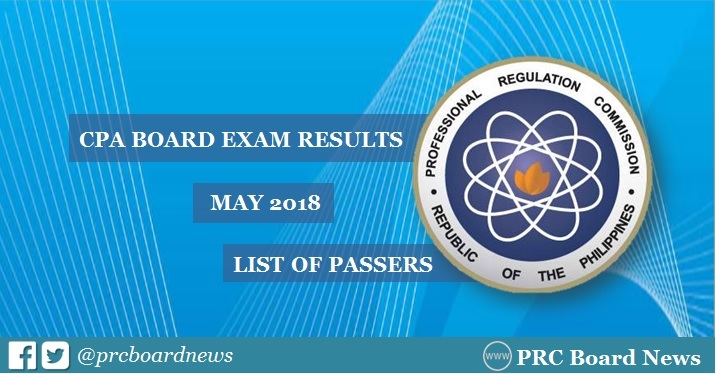 PRC administered the CPA licensure exam in the cities of Manila, Baguio, Cagayan de Oro, Cebu, Davao, Iloilo, Legaspi and Tacloban on May 13, 20 and 21, 2018. In May 2017 exams, results were out online in five (5) working days after the exams. PRC named 3,389 out of 9,645 (35.14%) who have passed the series of exams. In May 2016, results were also announced in 5 working days. A total of 2,967 out of 6,925 passed the tests. Good luck to all CPALE takers. I hope that this will be my time. To God be all the glory. Is that really possible? All? usaully wahat time po lumalabas ang result? God bless all who took the May 2018 board exam! What time ilalabas ang result? meron na po ba nakapaskil sa PRC Office? Nakakaiyak. Congrats po sa mga pumasa. wow... u have done your very best palangga.. my love.. my honey..
sa hinabahaba ng struggles na pinagdaanan.. ngayon nakamtan ang tamis ng tagumpay.. God bless you more langga..
Sa mga di nakapasa, sana'y wag kayong mawalan ng pag-asa. Manatili pa rin ang paniniwala sa Poong Maykapal at mag-pursigi pa. Saludo pa rin ako sa inyo! when po ilalabas list ng conditional examinees?